The arctic national wildlife refuge, land of black gold, has remained untapped. Only once have prospectors gained access. In 1986, Kick corporation, a partnership between native and business interests, commissioned the drilling of a test well, and the results of that drilling have been a closely guarded secret ever since, leaving only a solitary white box marking the footprint where the rig once stood. After a historic vote in congress, the kick well will reveal her secrets, and North industries will be there. Working in consort with environmental experts North industries will send advanced teams to map the area and determine strategic drilling locations. The movie starts with an arctic vista, beautiful in it's emptiness, except for the small plane flying overhead. It proceeds to land at the North outpost, and out comes Ed. Yes that's loudmouth Ron Perlman, gotta love him. Ed's only concern is getting the equipment in so they can start drilling, but he needs the greenies consent, and they won't cooperate. There has been a dramatic temperature rise in the permafrost in the past week alone. Hoffman heads out to his little shack near the outpost, and going over his notes, he sees temperatures as high as forty degrees. While out there the wind picks up and his papers fly everywhere, he stumbles out and sees what look like deer tracks, circling the shack, but there's nothing in sight. Meanwhile, Maxwell is curious about the white box, and heads out to take a look. He stands there, staring off into the distance. By nightfall, he's not back yet and they go out in search for him, he has abandoned his skidoo over 100 miles from the outpost. Right before enlarging the search, he magically shows up, looking dazed, with what they call "big eye". The horror starts from here. This movie was really reminiscent of John Carpenter's The Thing which I loved, and I have to say I've been a Ron Perlman fan ever since City of Lost Children. So basically you take these two elements together, throw in a great storyline, some great acting, an incredible ending, mix it all together... and you have a solid 8. Go see it! It's great! 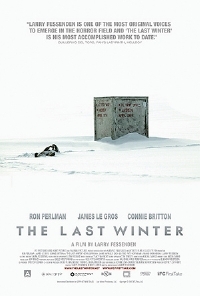 Larry, please, make The Last Winter part 2!